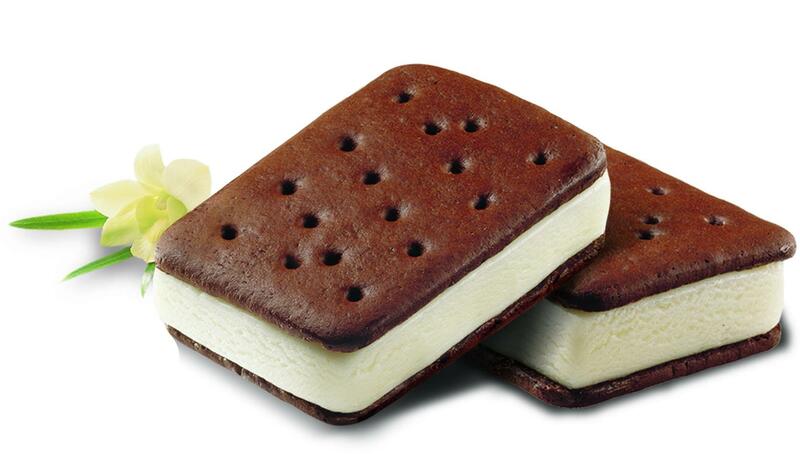 Being on a dairy-free or plant-based diet doesn’t mean you can’t enjoy an ice cream sandwich because So Delicious Dairy Free makes a creamy and rich vanilla “ice cream” sandwich with almond milk instead of cow milk. 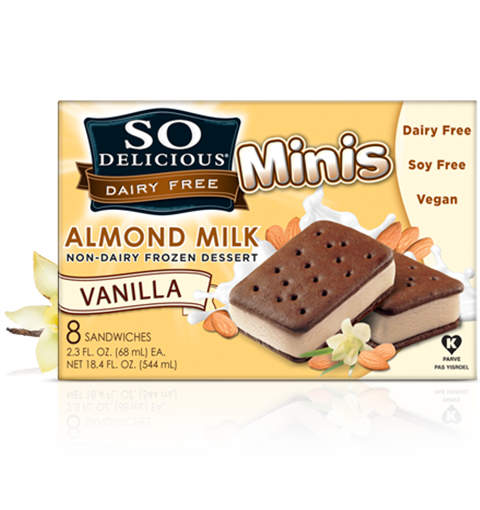 So Delicious Dairy Free vanilla sandwiches are called “minis.” At 2.3 ounces each, the frozen dessert (technically, this treat cannot be called “ice cream” being dairy-free) is the perfect size for a snack or dessert any time of the year. Made with almond milk (almonds and water), organic dried cane syrup, coconut oil, vanilla extract, natural flavor, gum arabic, carob bean gum, and guar gum enveloped with two chocolate wafers made with wheat flour, dried cane syrup, palm oil, brown rice syrup, caramel color, baking soda, cocoa, sunflower lecithin, salt, and natural flavor, So Delicious Dairy Free Vanilla Minis taste just like an ice cream sandwich should: velvety smooth vanilla “ice cream” sandwiched between two moist chocolate wafers that stick to your teeth with every bite (just like the dairy variety), making the flavor linger long after the ice cream and wafers have melted in your mouth. Each mini vanilla sandwich has 90 calories with 3.5 grams of fat, 2 grams of protein, 7 grams of sugar, 1 gram of dietary fiber and 45 mg of sodium. The minis are packaged 8 to a box and can be purchased at grocery stores nationwide including Whole Foods Market in the ice cream novelty freezer section, for about $5.99 a box. The company also makes a version made with coconut milk. To read more about these products and other So Delicious Dairy Free products, click here.